The COBRA® Strap Handler was created by a flat bed trucker, to help flat bed truckers save time and wear and tear on their arms and shoulders. The COBRA® Strap Handler launches heavy tie-down straps effortlessly, over your high loads. 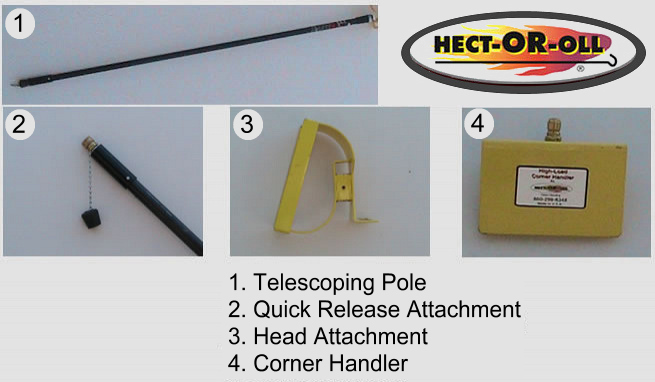 The patented strap housing along with its telescoping pole, provides the perfect height for strap positioning. The COBRA High Load Strap Handler is a 2 in one tool, it also makes placing edge protectors a breeze. How much time do YOU waste tossing straps over your flatbed? Tired of missing the cargo. Are you re-rolling straps for a second shot? Have you suffered an injury or had a close call when throwing straps? Do you have arm and shoulder pain? 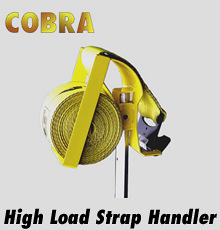 Then you need the COBRA High Load Strap Handler. Made in the U.S.A. the COBRA® Strap Handler is constructed of heavy-duty aluminum. The COBRA housing is powder coated, thermally bonded, creating a superior finish. Want to save time and roll your straps with ease? 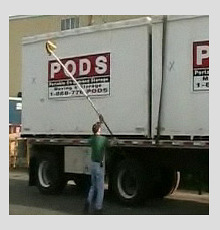 If so, check out our pneumatic Strap Roller, it’s fast and efficient. Using a pneumatic roller may also help to reduce repetitive motion injuries. Comes in right-handed and left-handed versions. COBRA® Black Threaded End Cap keeps the Quick Release unit debris free. A quality product made in the U.S.A. The COBRA® Strap Handler is constructed of heavy-duty aluminum with a baked-on powder coated finish.